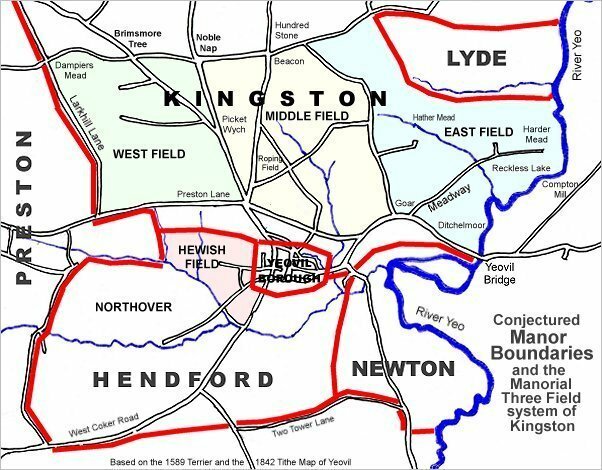 In Medieval times Dampier's Mead was a very large sub-field, probably a common field, in the northwest of the great manorial West Field of Kingston Manor. The 1589 Terrier, in describing the West Field recorded "From Jacobs Door being the Townsend of Kingston to Preston Townsend and up to Dampiers Mead corner...."
By the end of the eighteenth century the large field was further sub-divided into smaller fields with just one retaining the name of Dampier's Mead. At one time this relic Dampier's Mead (Parcel 1350) was part of Larkhill Farm but at a generally unsuccessful sale of the farm in 1899 it was the only parcel of land to be sold. In this sale Dampier's Mead was sold for £700 (around £70,000 at today's value) to Mr F Palmer. 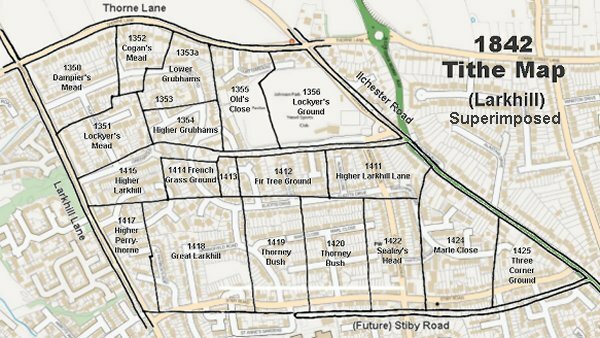 Dampier's Mead was bounded to the west by Larkhill Lane, to the north by Thorne Lane, to the east by Cogan's Mead (1352) and to the south by Lockyer's Mead (1351). There may be a connection with the famous glove manufacturing family. The 1846 Tithe Apportionment recorded Dampier's Mead as 11a 3r 20p and noted its use as meadow - grassland not regularly grazed by livestock but allowed to grow unchecked in order to produce hay. Strangely, the ownership of Dampier's Mead is not recorded in the Apportionment. 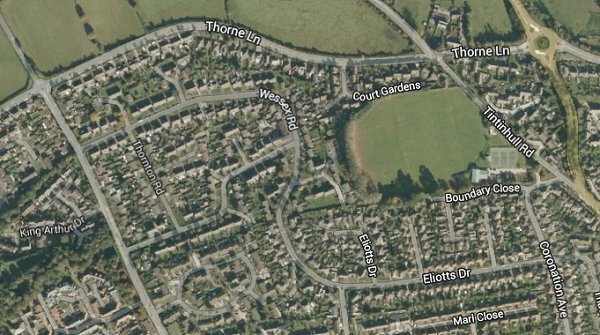 Today the site of the former Dampier's Mead is occupied by the houses and gardens of Thorne Lane and Wessex Road. 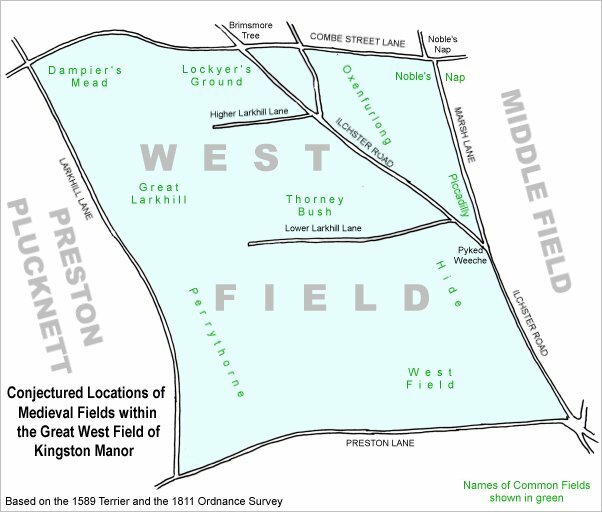 A conjectural map of the great West Field of Kingston Manor showing ancient sub-fields, most likely common fields, within the overall bounds of West Field. 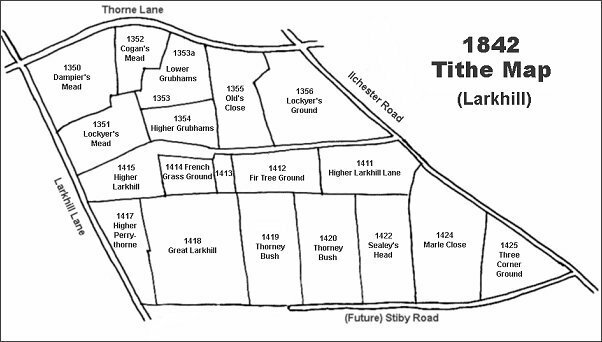 The Larkhill area reproduced from the 1842 Tithe Map. Dampier's Mead is top left. 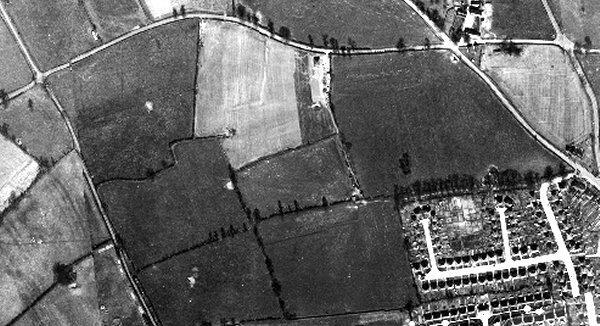 The 1946 aerial photograph showing Dampier's Mead at top left at the junction of Thorne Lane, running across the top of the photo, and Larkhill Lane along the left side. The 1842 Tithe Map superimposed (slightly out at the bottom) over a modern map. A notice following an attempted sale of Larkhill Farm from the 3 November 1899 edition of the Western Gazette. The parcel that sold was Dampier's Mead (Parcel 1350) which went for £700 (around £70,000 at today's value).